9 nerve centres of your organisation are highlighted to define an action plan that matches your employees to define the priority workshops. Each team member is asked 81 questions. A 3D image of the entire system, called the Resonance Diagnosis, is produced. 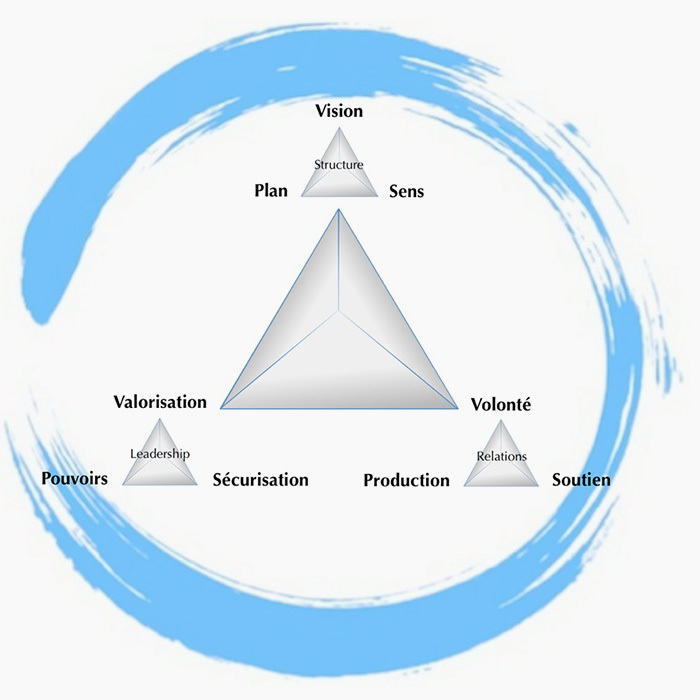 The Vision is a perception of the future supported by the leader of an Organisation. The leader imagines what the world will be like in the more or less near future. He describes what the sector of activity in which his Organisation works will resemble. He then positions his Organisation in this future. This term designates the direction in which the Organisation wants to go, the strategic orientations, and the meaning that the employees give them. Antoher word for authority. This notion is defined by the mission status and the role of the leaders in their decision-making scope. How do the leaders protect the Organisation’s strategic orientations and the activities of the employees? The statutory or occasional leaders have the duty to enhance the Organisation’s Vision and enhance their employees. Is defined by the impact that the quality of relations within the teams has on productivity. Support is also sometimes referred to as solidarity in the Diagnosis. It reflects determination and initiative of each person to communicate, speak out and solve difficulties.